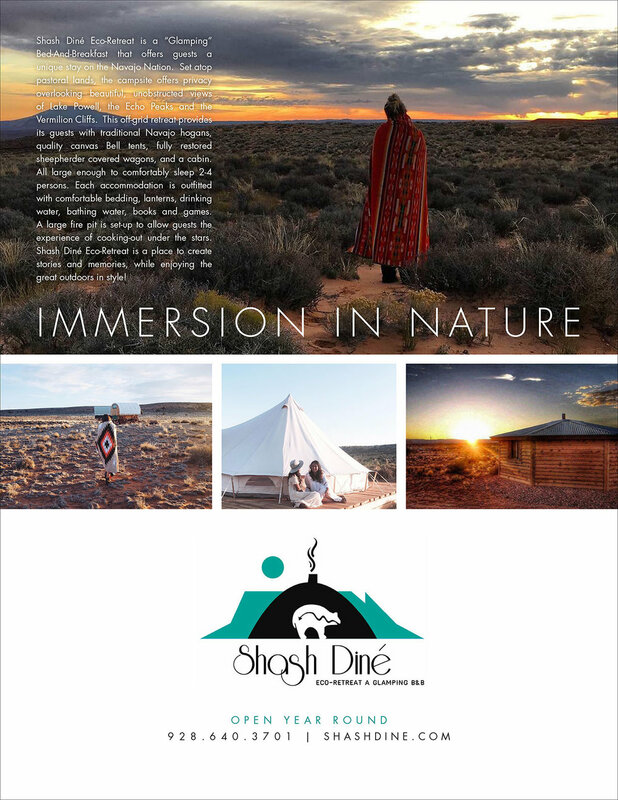 Shash Dine' Eco-Retreat is a “Glamping” Bed-And-Breakfast that offers guests a unique stay on the Navajo Nation. Set atop pastoral lands, the campsite offers privacy overlooking beautiful, unobstructed views of Lake Powell, the Echo Peaks and the Vermilion Cliffs. This off-grid retreat provides its guests with traditional Navajo hogans, quality canvas Bell tents, fully restored sheepherder covered wagons, and a cabin. All large enough to comfortably sleep 2-4 persons. Each accommodation is outfitted with comfortable bedding, lanterns, drinking water, bathing water, books and games. A large fire pit is set-up to allow guests the experience of cooking-out under the stars. Shash Dine' Eco-Retreat is a place to create stories and memories, while enjoying the great outdoors in style! Our accommodations can be easily booked through Airbnb, and other booking sites, direct by email - shashdineecoretreat@gmail.com, or phone - 928-640-3701. Navajo Churro sheep, Angora goats are raised on the ranch in accordance with Navajo traditions. The Bed & Breakfast has been built to accommodate guests year-round to provide a peaceful, unique Navajo cultural experience.